It’s time to publish the July statistics derived from the corresponding cyber attacks timelines (Part I and Part II). As always, let’s start from the Daily Trend Chart. July has seen a peak of activity during the second week with a generally sustained trend across the whole month. 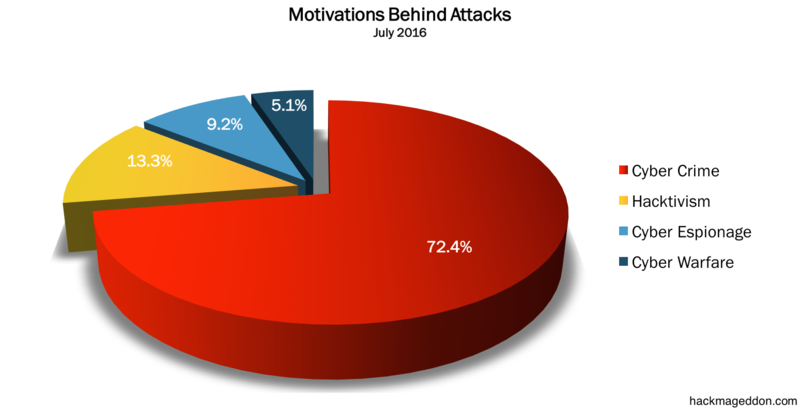 Cyber crime ranks on top of the Motivations Behind Attacks chart with 72.4% (was 69.1% in June). Hacktivism confirms its decreasing trend (13.3% vs. 15.5% in June). Cyber Espionage is substantially stable (9.2% vs. 9.1% in June), whereas Cyberwarfare drops to 5.1% vs. 6.4% in June. For the second month in a row, account hijackings rank on top of the known Attack Vectors with 14.3% (was 14.5% in June). Similarly to June, DDoS attacks follow with 12.2% (was 12.7% in the previous month), whereas, again, targeted attacks rank at number three with 11.2% (was 12.7% in June). No surprise in the Distribution of Targets chart, since industry leads with 31.6% (a sharp increase in comparison with June when it was 24.5%). Governments rank at number two and soar to 16.3% (was 10% in June), ahead of organizations (12.2% vs. 14.5% in June), single individuals (8.2% vs. 10.9% in June) and Healthcare (7.1%, a strong peak compared to 1.8% in June). The Industry Drill Down chart sees Software companies on top (16.1%), ahead of Video Games and Telcos. Whereas the actions of Guccifer 2.0 against the Democratic Party, push Political Parties on top of the Organization Drill Down chart. As always, bear in mind that the sample refers solely to the attacks included in my timelines, aiming to provide an high level overview of the “cyber landscape”.